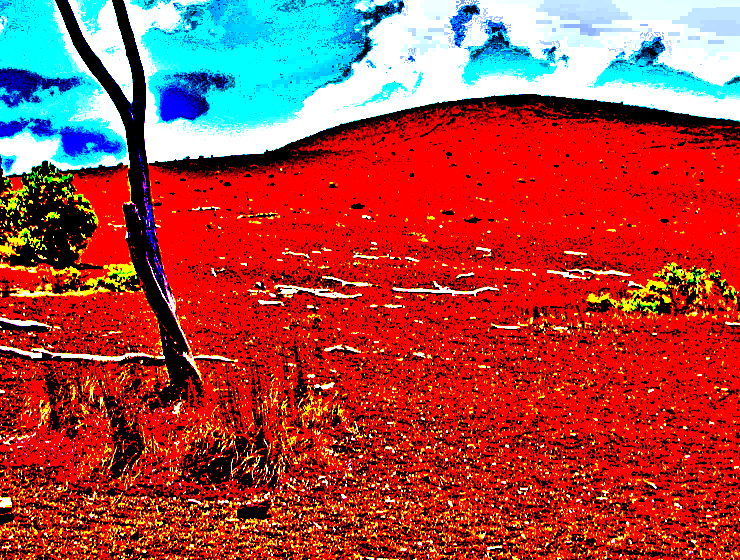 There are many wondrous, enigmatic and fascinating attractions on the Big Island of Hawaii, some better known than others, many out of the way and generally off the beaten track. Tour Guide Hawaii has produced an encyclopedic collection of the most up-to-date information, presented as short GPS-cued videos, in an app downloadable to iPhone and iPod Touch that covers the entire Big Island, highlighting the popular and the uncrowded, the famous and the secluded, the adventurous and the relaxing. A short, 20 minute-or-so hike on a section of Crater Rim Drive abandoned after an earthquake made the crater edge unstable. 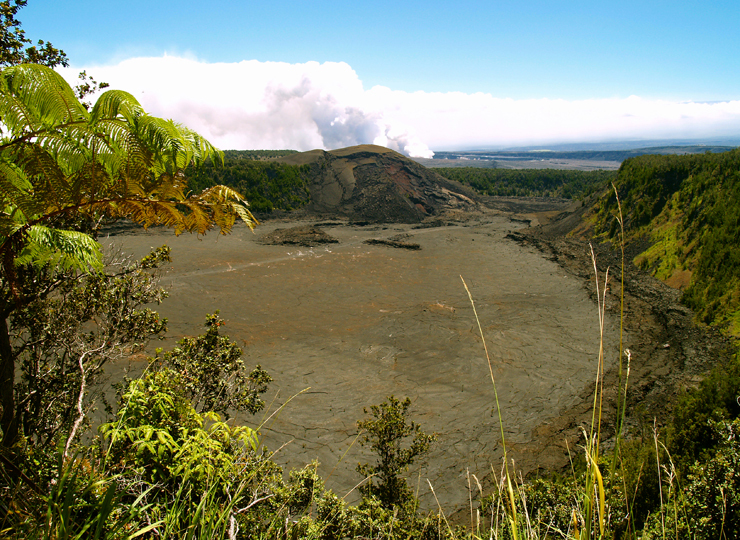 Strolling through lush fern and o’hia forest brings one to spectacular views of the Kilauea Caldera, Waldron Ledge and Pu’u Pai at the mouth of Kilauea Iki Crater. This hike is one of the few places where bicycles are allowed, and the generally shaded road makes for a pleasant, but short, ride or hike. This trail is a great way to get away from noise and traffic and experience the lush, high altitude fern forest firsthand. 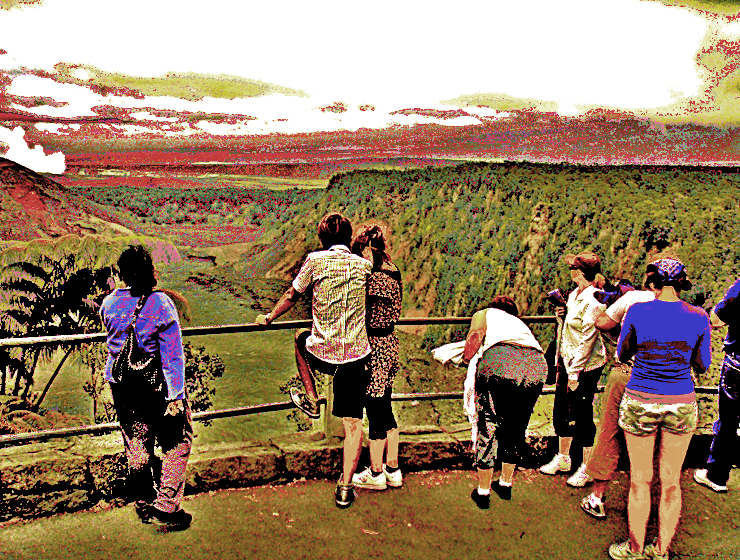 The overlook at Waldron Ledge is a particularly spectacular place, perched on the edge of the vast wasteland of Kilauea Caldera. 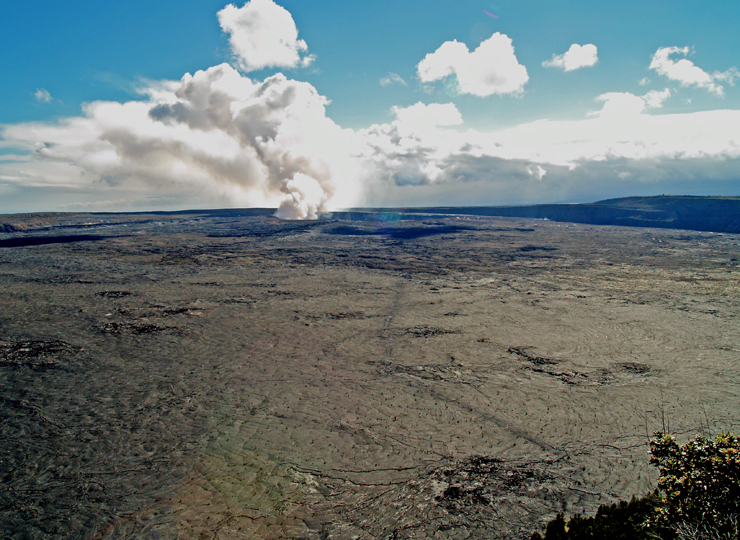 It’s a good place to observe the current eruption in Halema’uma’u, especially early in the morning when the rising sun lights up the eruption cloud, or in the evening when the setting sun shines through it. No services are available once you leave the area of the Visitor’s Center and Volcano House. To see the new iPhone/iPod Touch App, please visit http://www.tourguidehawaii.com/iphone.html. The best of Tour Guide Hawaii’s free content about traveling to, and exploring, the Big island, can be found here. For more information on traveling to Hawaii in general and on touring the Big Island in particular, please also visit www.tourguidehawaii.com and www.tourguidehawaii.blogspot.com. Pu’u Pua’i, which means “gushing hill”, is a cinder cone perched atop the rim of Kilauea Iki. 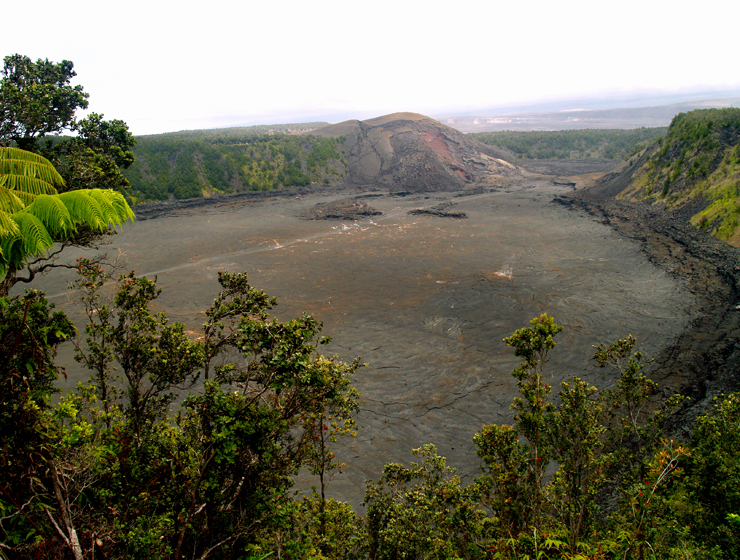 At Pu’u Pua’i Overlook an incredible view of Kilauea Iki, which means “Little Kilauea” spreads beneath you. 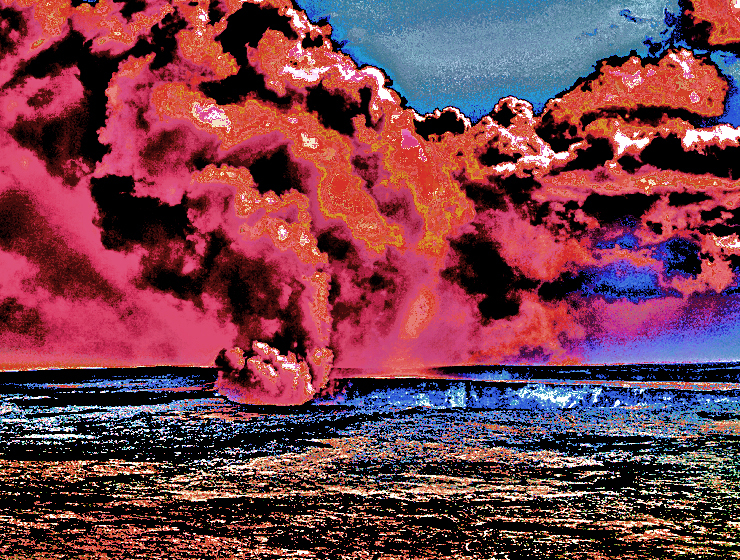 Eruptions of Kilauea Iki in 1959 followed almost a century of quiescence and produced fire fountains exceeding 1900 feet—the highest on record anywhere. 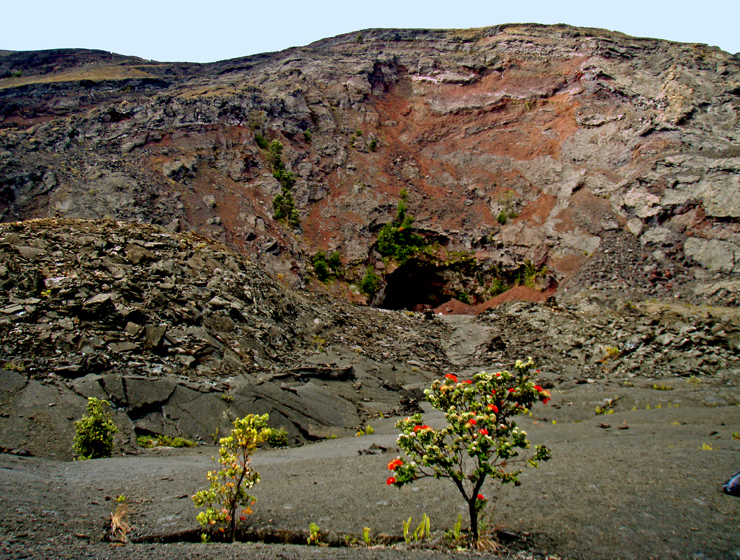 The overall eruption proceeded in “spurts” of activity—brief eruptive events separated by times of quiet–which produced enough lava and airfall material to bury a football field 15 inches deep every hour (about two million tons of lava per hour). However, in between eruptions the lava drained back into the vent, only to be ejected again and again over the 36 day life of the eruption. 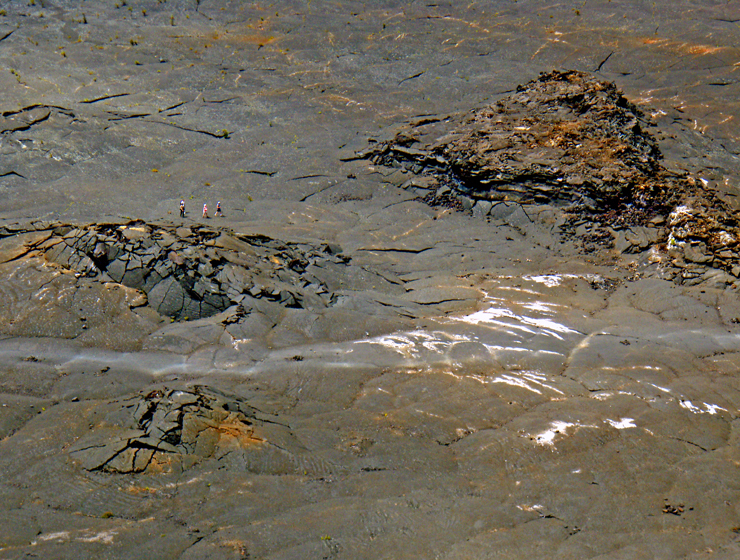 Today, the mile-wide cooled and solid surface of the lava lake, tucked 400 feet below the crater rim, is cracked and undulating, pocked and tiled in tilted pahoehoe blocks, issues steam from many vents. 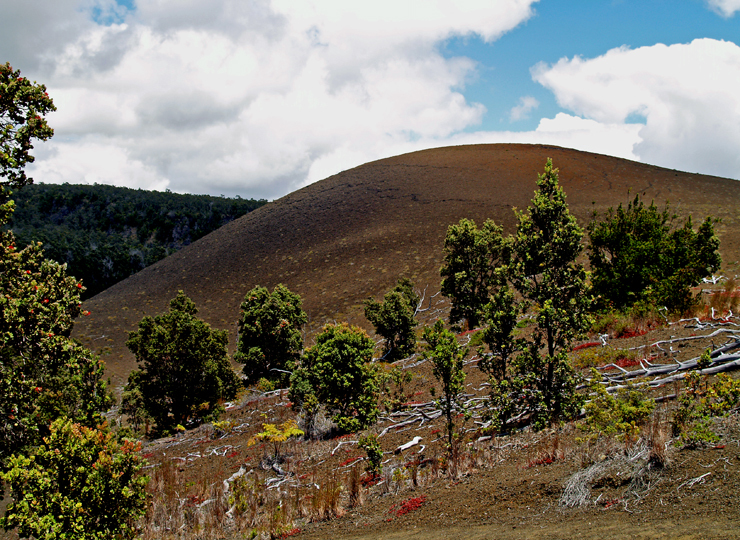 Crossing the crater floor on this surface provides one of the most interesting hikes in the Park. 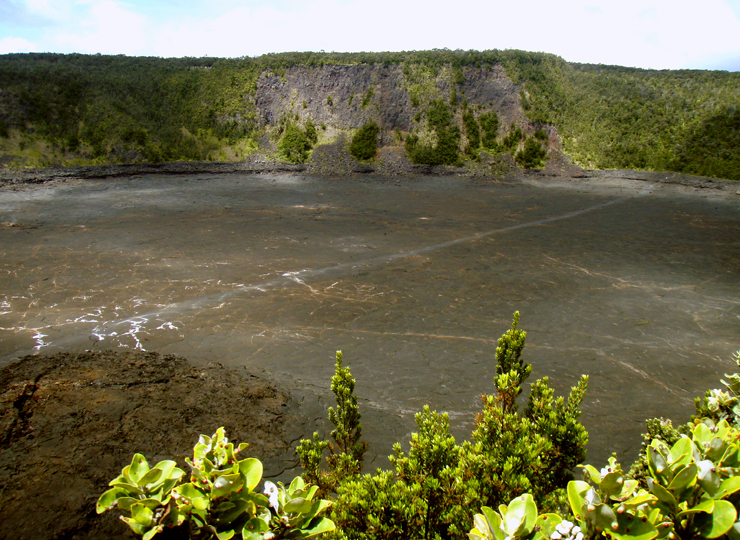 Looking up from the bottom of the crater, one can see the distinctive “ring around the crater” marking the high point of the lava lake during the last eruption. 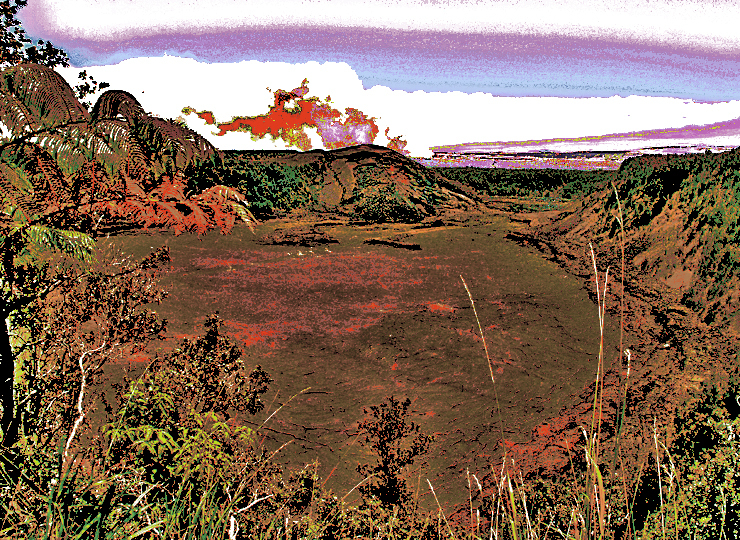 Hot, liquid rock still roils only a few hundred feet below the hardened modern surface of the crater floor. 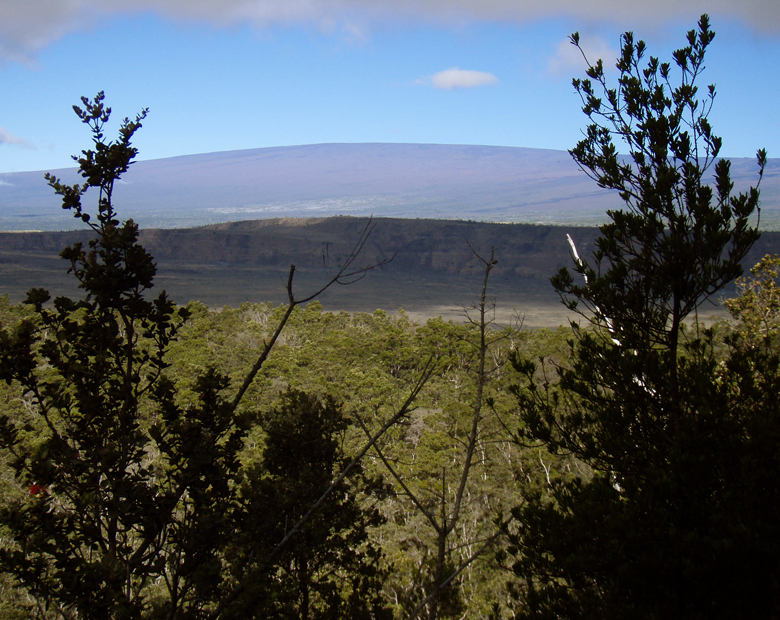 Distances are difficult to comprehend here, unless you see hikers on the trail, across the rim or on the crater floor for scale. 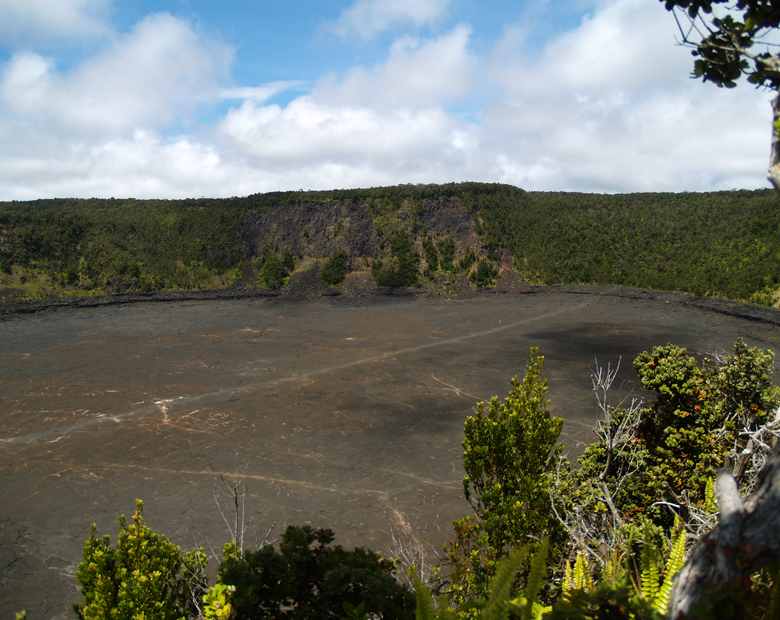 Once you have an idea of the magnitude of this crater, bear in mind that the fire fountains in the 1959 eruptions, at their peak, reached about four times the height of the current crater walls. 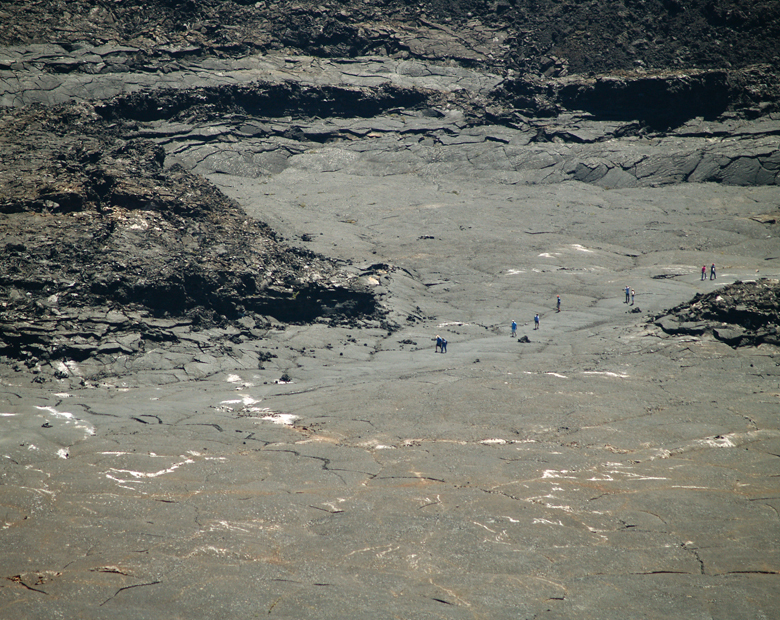 It is both extremely unsafe and ecologically unsound to visit the actual summit of Pu’u Pua’i. The entire Devastation Trail area is an outdoor laboratory in forest regeneration after the devastating burial in hot air fall material. Please stay on designated trails and do not wander out across the cinder landscape; you will destroy delicate plant life and interrupt soil-forming process, disturbing the natural laboratory. 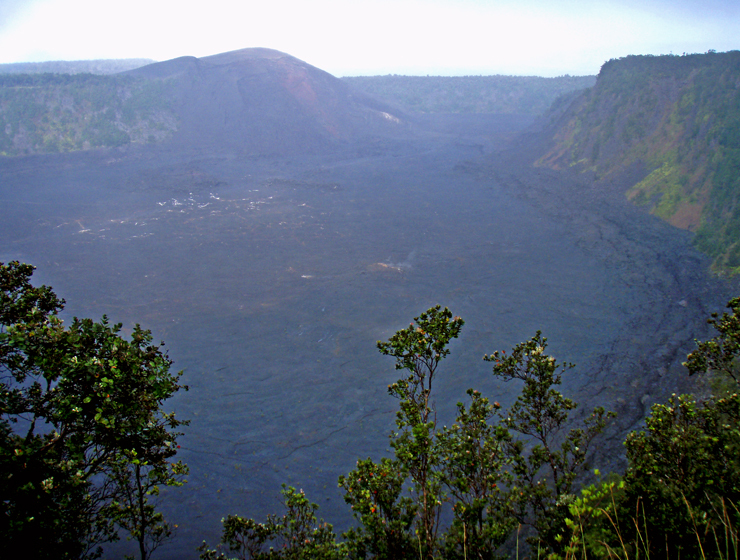 For more information on Kilauea Iki, please go here; for information on hiking the Kilauea Iki trail, please go here; for information on the Devastation Trail area adjacent to Pu’u Pua’i, please go here. All media copyright 2010 by Donald B. MacGowan. All rights reserved. 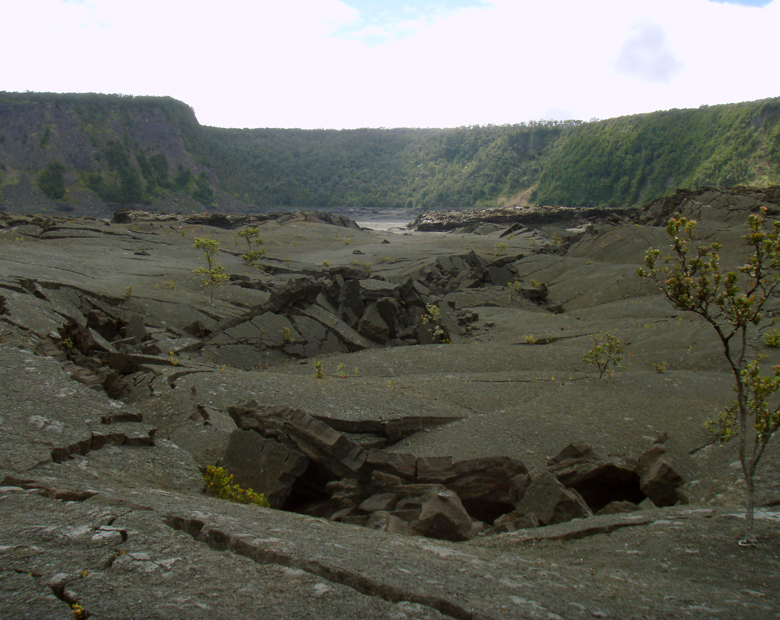 Kilauea Iki, meaning “little Kilauea”, is the still seething remnant of a quite recent (1959), spectacular eruption that filled the crater with a molten lake of lava and threw fire fountains as much as 1900 feet in the air. For a sense of scale, the world’s tallest building, the Taipei 101 which is 101 stories tall and 1667 feet high, would be dwarfed by these fire fountains. 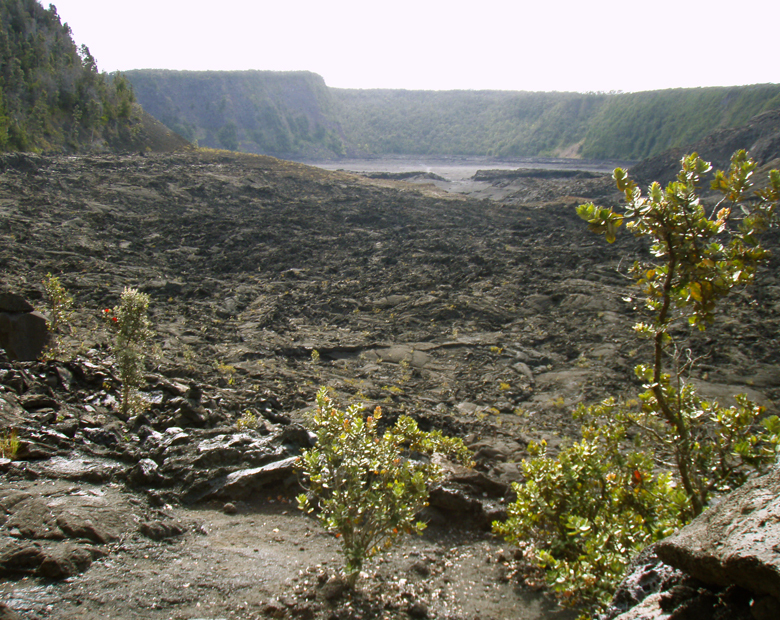 Distances across the crater are hard to guess, as steam jets up from small cracks in the now-hardened lava-lake’s surface and the minute specks of hikers cross its black expanse, but the crater today is more than a mile long, 3000 feet across and almost 400 feet from the rim to the surface. 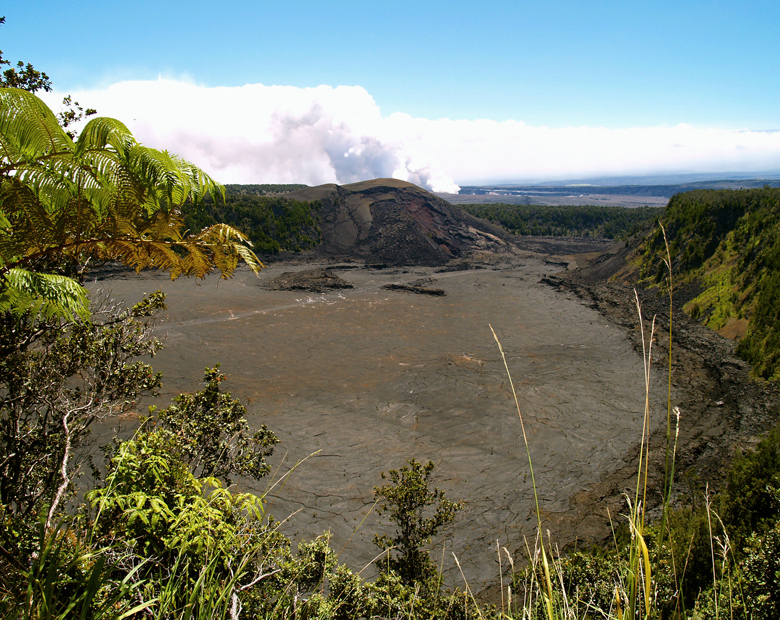 At it’s peak, the volcano spewed about two million tons of lava per hour; however, between spurts, much of this liquid drained back into the subterranean plumbing of the caldera, thus giving the distinctive “ring-around-the-crater” look to Kilauea Iki. 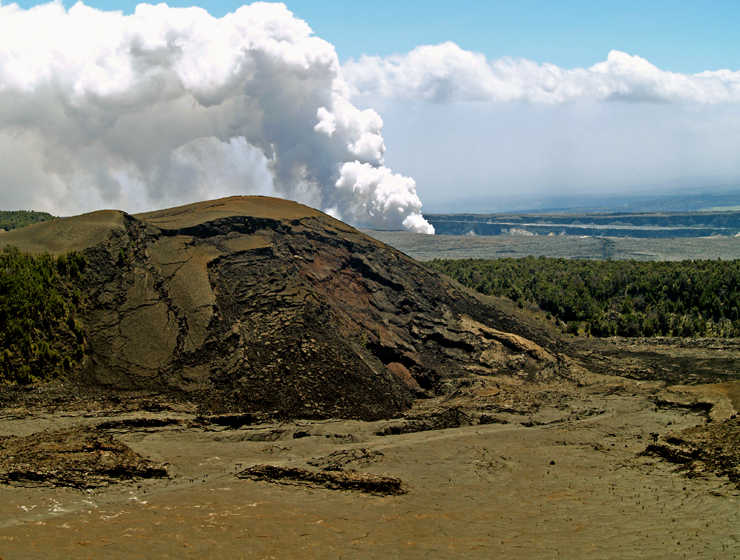 The active vent for these eruptions was at Pu’u Pua’i; you can go here for more information on the Pu’u Pua’i eruptions. 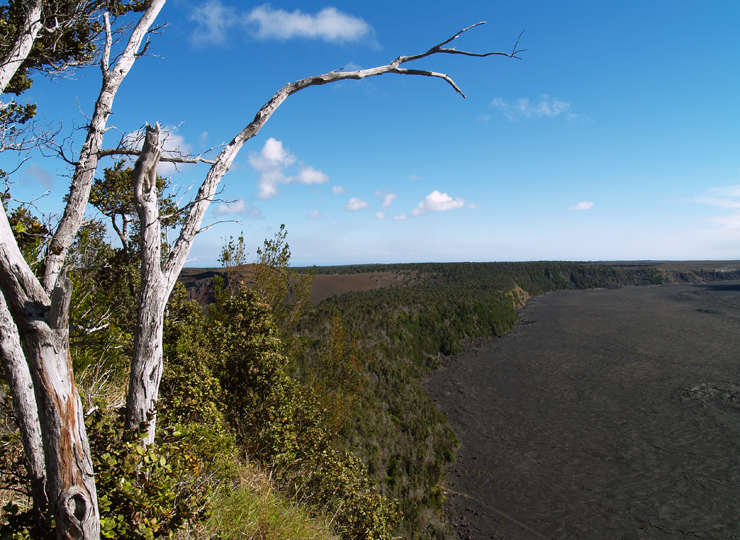 The hike down into, and across, Kilauea Iki is perhaps the best short hike in the park. 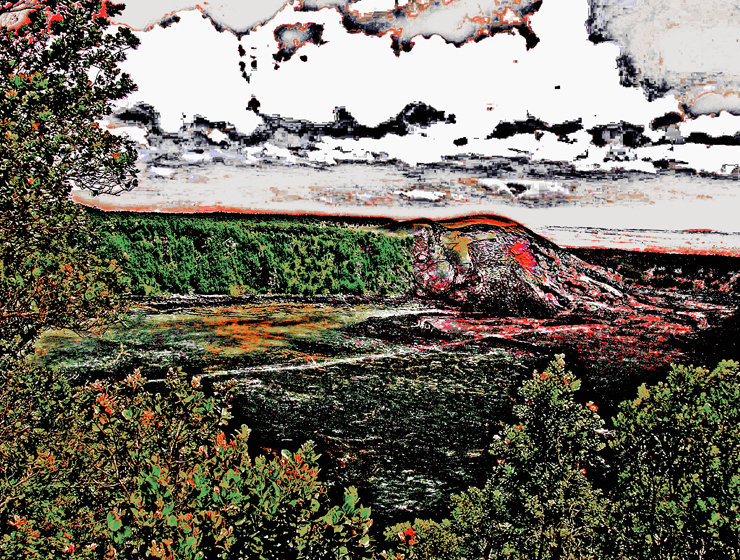 Go here to find out more on making this spectacular, but fairly easy, trek. To see the new iPhone/iPod Touch App, please visit http://www.tourguidehawaii.com/iphone.html. The best of Tour Guide Hawaii’s free content about traveling to, and exploring, the Big island, can be found here.For more information on traveling to Hawaii in general and on touring the Big Island in particular, please also visit www.tourguidehawaii.com and www.tourguidehawaii.blogspot.com. For independent reviews of our product, written by some of our legions of satisfied customers, please check this out. 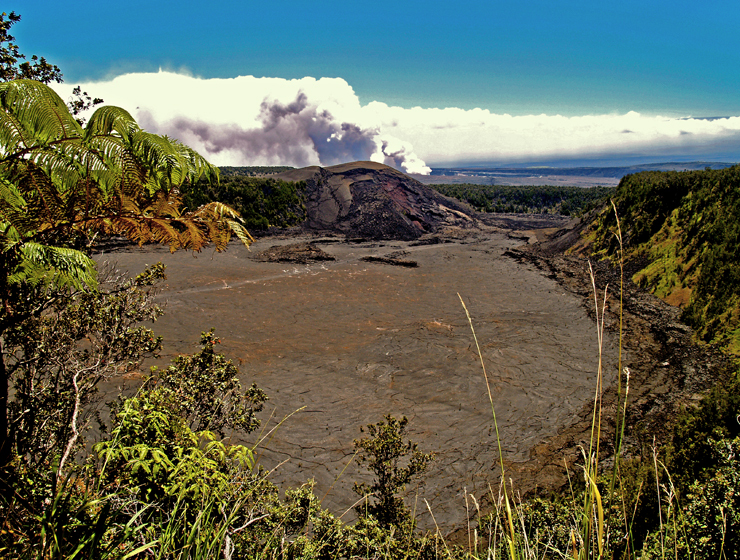 When Kilauea Iki erupted from vents on Pu’u Pua’i in November of 1959, several feet of hot ash and cinder-sized pieces of pumice fell on the lush fern forest downwind. Devastation trail follows the edge of this inundation, linking the Kilauea Iki Overlook Parking lot with another parking lot at the intersection of Crater Rim Drive with Chain of Craters Road in a wonderful and interesting 0.7 mile (30 to 45 minute) hike. 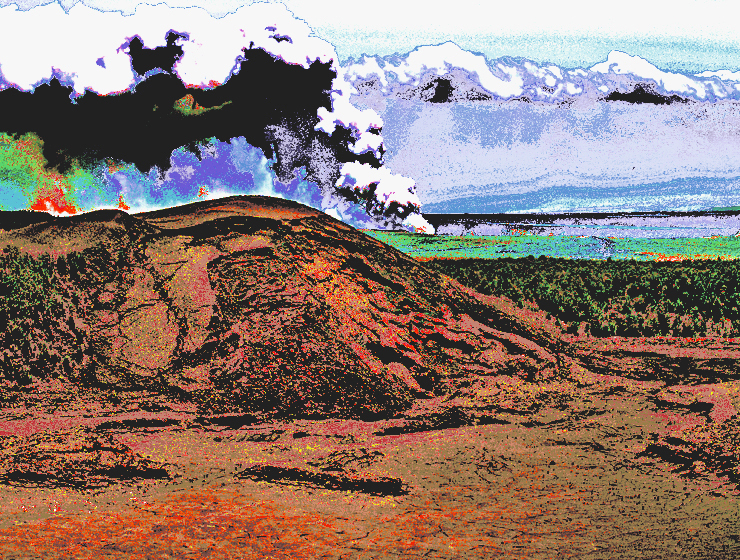 During the eruption, fire fountains of molten lava shot up as high as 1900 feet tall from the eruptive rifts. For a sense of scale, the world’s tallest building, the Taipei 101 which is 101 stories tall and 1667 feet high, would be dwarfed by these fire fountains. These immense fountains spread ash, pumice and spatter all around the area, as well as fed liquid lava to the lava pond within Kilauea Iki crater. 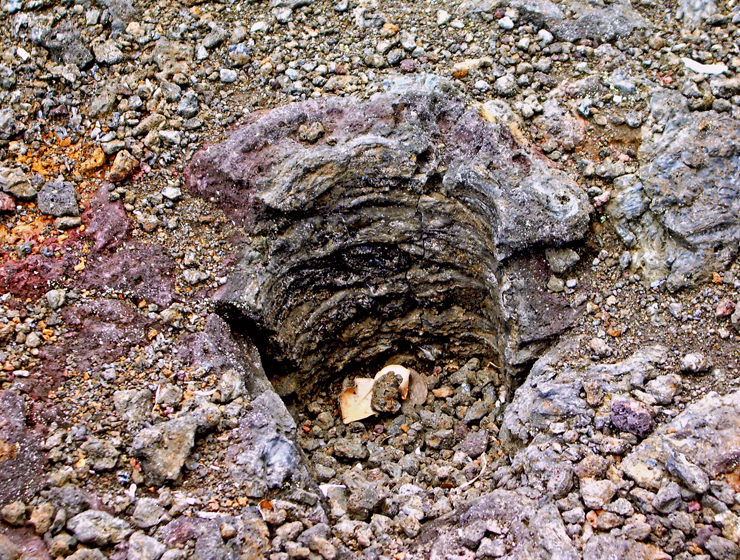 The spatter was hot and plastic enough to weld together into the spatter cones you see on Pu’u Pua’i, however, the tephra and ash pumice spread out and fell downwind, depositing an immensely thick (as much as 3 meters) blanket when the eruption column collapsed between fountains. 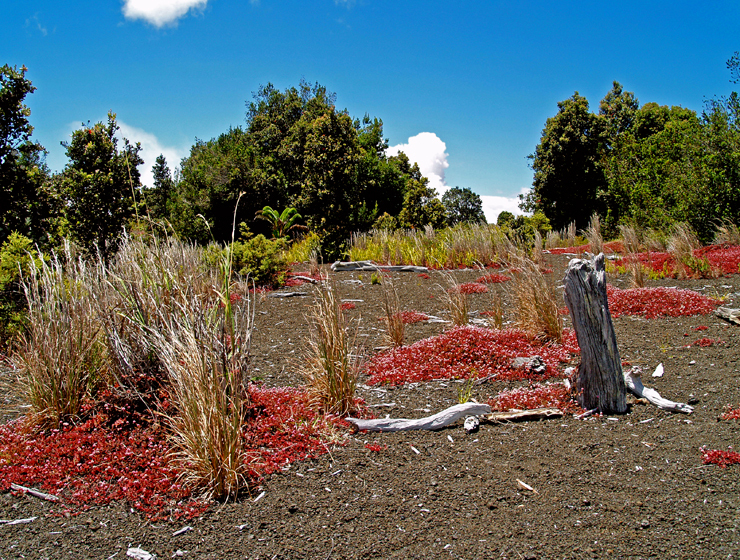 This pumice buried lush forest, which is preserved on the eastern side of Devastation Trail. 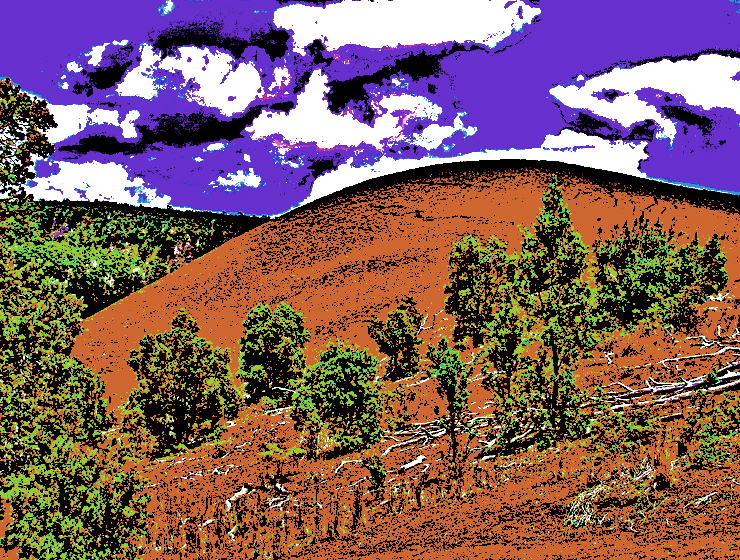 On the west side of the trail is the sterile, moon-like devastation surface of pumice. A few o’hia trees, dead and bleached, poke up through the pumice and very gradually some o’hia, ohelo and ferns are beginning to recolonize the dead zone. Look for numerous tree molds along the trail in the section about a third of the way from Pu’u Pua’i to the Devastation Trail parking lot. Pumice results when there is a lot of gas and water dissolved in the liquid lava. As the lava is erupted, pressure is released, the melt begins to cool quickly and the gas is rapidly exolved from the liquid lava—much the way carbon dioxide is exolved as a bubbly froth when you shake a can of soda pop. The spatter and lava in the ponds cool slowly enough for all the gas to escape, and the resultant rock is very dense when it finally solidifies. The pumice, however, chills so rapidly it forms a glass-like, frothy substance because it traps the bubbles. This is why pumice has a low enough density to float on water. Hawaii is, in fact, an island that is served by very few roads, that many people come to visit each year and that makes most of its wealth from the tourism industry. Given this, it’s quite surprising how hard it can be to find useful, reliable and up-to-date information about anything from “is your favorite restaurant still in business” to “how’s the snorkeling this month?”. Road names are in the unfamiliar Hawaiian language; friendly locals give helpful directions, but in rapid-fire pigeon English using landmarks unfamiliar to the visitor and many guidebooks are either woefully out of date or flat wrong. The first time visitor to Hawaii may be overwhelmed when bombarded by advertising disguised as visitor information, overzealous salespeople from rapacious time-share resorts and racks and racks of of advertising for tours, attractions and restaurants. Even the experienced Hawaii traveler may find it difficult to ferret out the information he needs to find a unique, secluded or unusual experience in Paradise. 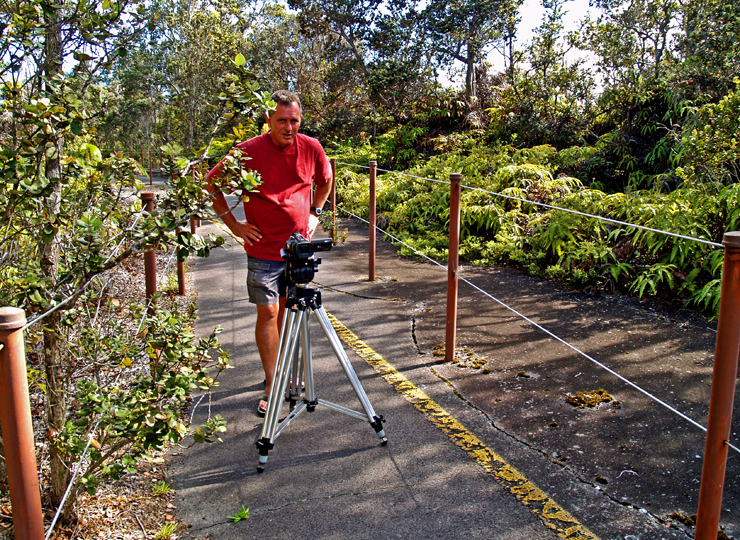 Finding current, reliable information on hikes on the Big Island can be equally frustrating. Clearly, the visitor to Hawaii can use some help finding special places in general and information about, and help getting to, the best hikes on Hawaii Island. To help you find the more secluded, wild and exotic destinations in particular, and to help you get more out of your Hawaii vacation in general, Tour Guide Hawaii has released a brand new iPhone/iPod Touch App. This “must have” travel app is packed with hours of informative video on the most interesting places on Hawaii; helps navigate you to all the most popular visitor destinations, the most interesting attractions, the most romantic and secluded beaches; helps you effortlessly find hikes, snorkel spots, historical and cultural landmarks, shopping and dining. And of course, our new App includes directions to, and rating of, all the public restrooms! Learn all about the App, here. 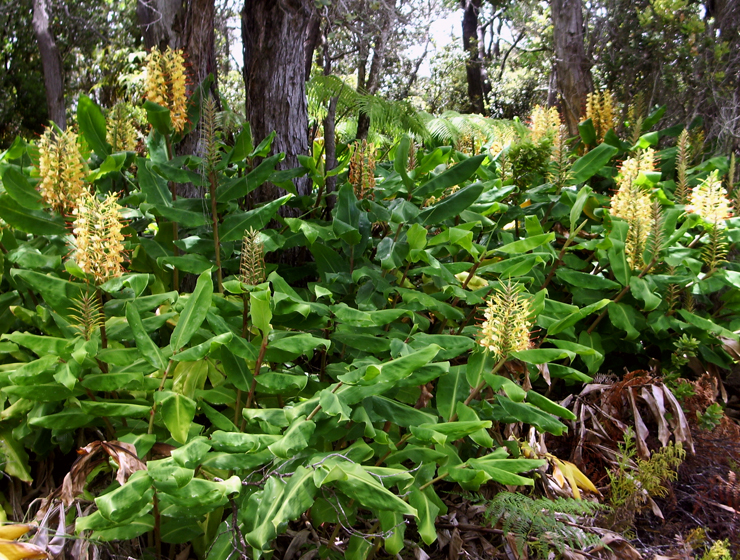 But first, let’s talk about what is arguably the finest short hike on the Island of Hawaii. 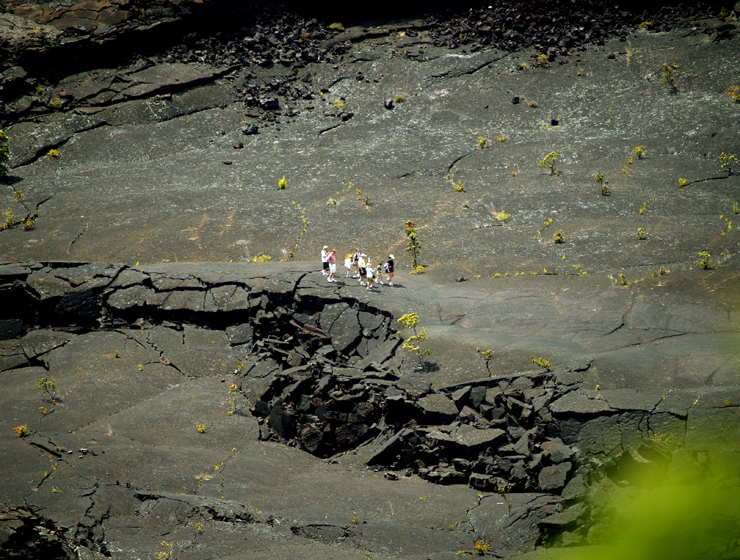 Perhaps the finest short day hike in Hawaii Volcanoes National Park—and one of Hawaii Island’s best hikes, this four-mile, 2-3 hour trip climbs down into, across and back out of Kilauea Iki Crater. 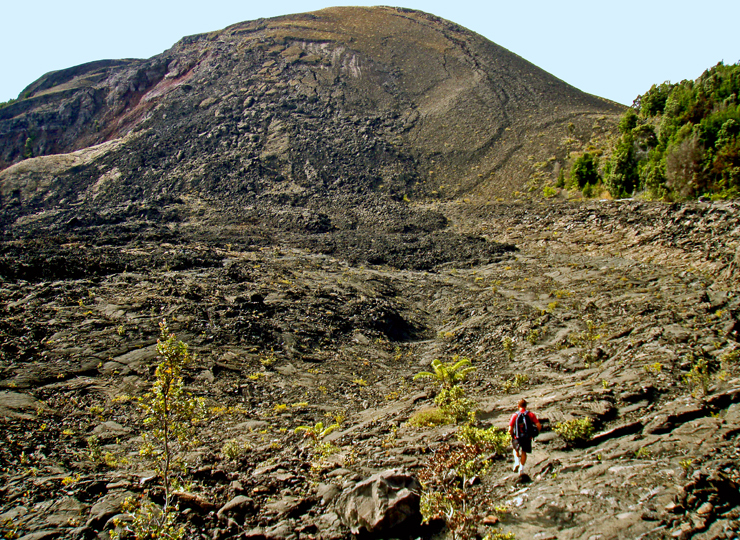 Crossing the crater floor on this surface provides one of the most interesting hikes in the Park. 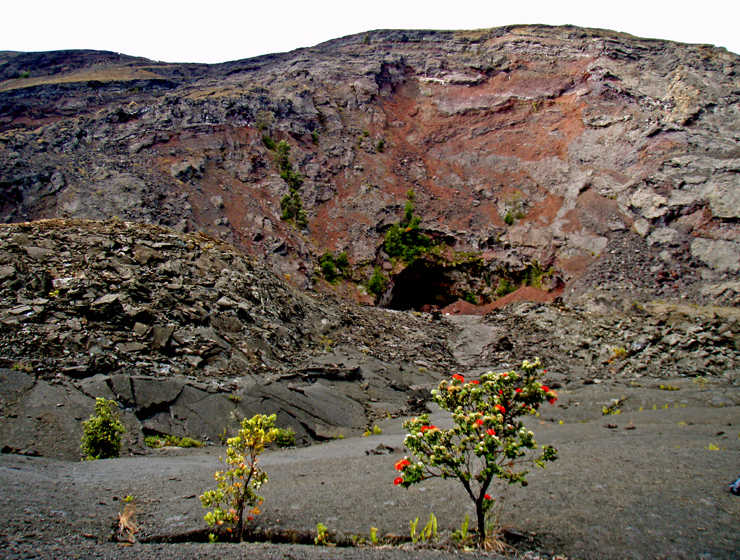 Looking up from the bottom of the crater, one can see the distinctive “ring around the crater” marking the high point of the lava lake during the last eruption. 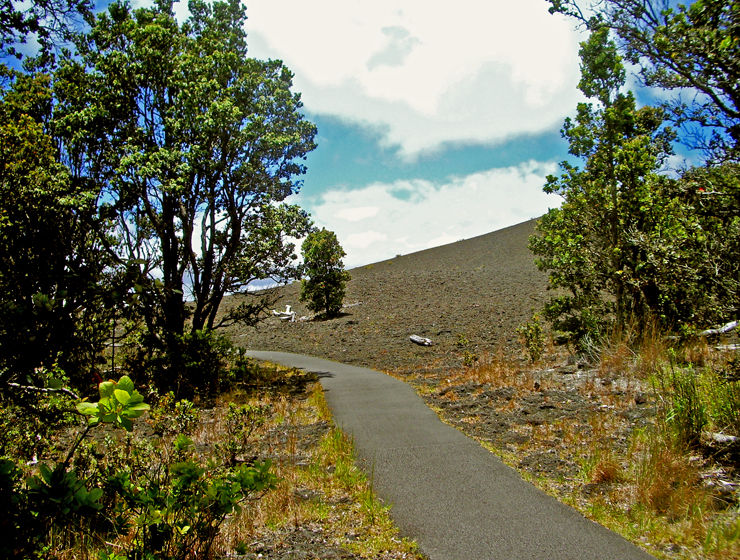 The four mile loop-hike descends from the rim in two places and crosses the crater floor in about three hours hiking at a nominal pace, giving one an intimate feel for volcanoes, Hawaiian-Style. 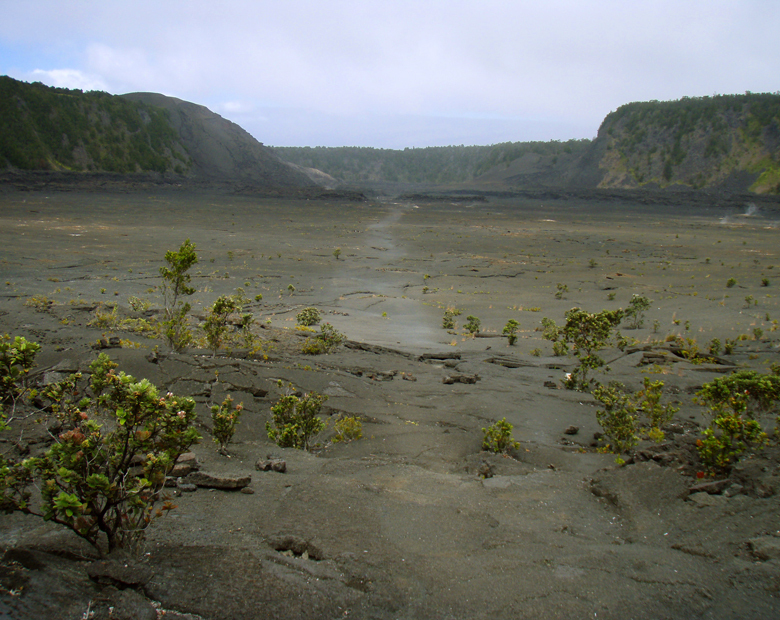 Along one side, thick fern and ohi’a forest skirts along the rim and on the other, lush tropical rainforest crowds to the very brink of the crater; bleak volcanic desert lines the crater walls and covers the floor. The start and finish of the hike are along well marked, wide trails following the rim with handrails and stairs in some spots as you begin to descend into the crater. 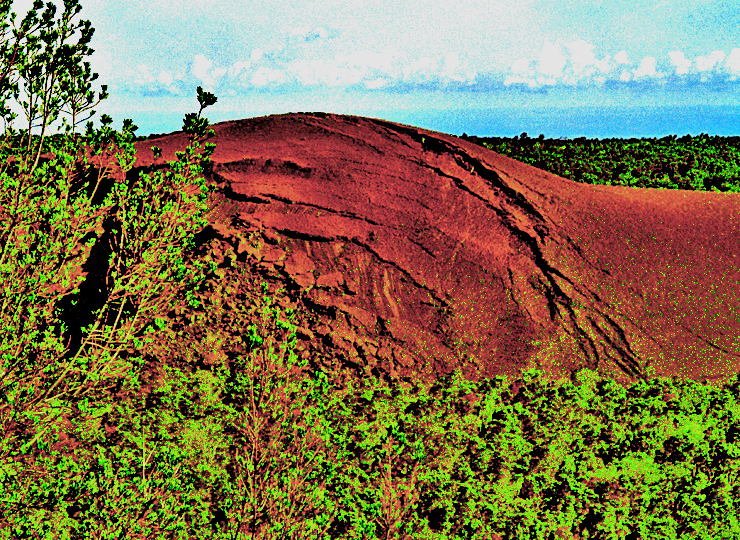 The remainder is an easily followed, well marked trail with stone ahu (cairns) over the crater floor. 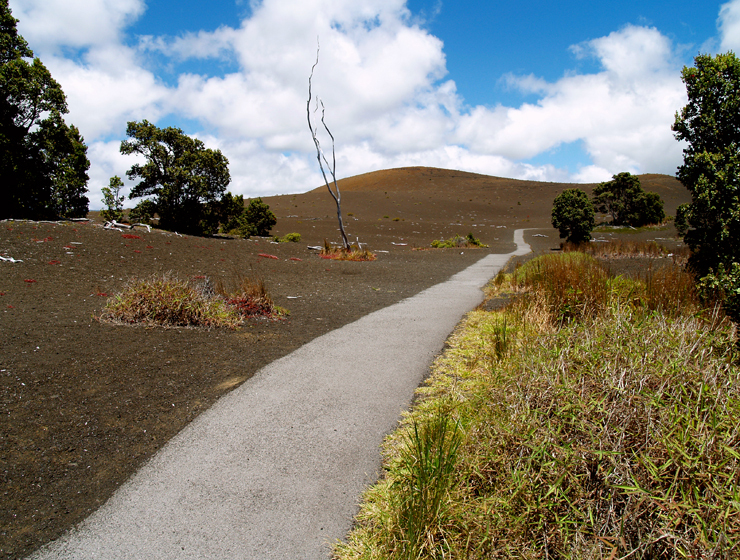 The hiker should keep their eyes open for Pele’s Hair and Pele’s Tears (fine, thread-like and bead-like deposits of volcanic glass), gaseous vents and other marvels of the living lava mountain. Bore-hole measurements taken in 1988 indicated that roiling molten lava was lying only 230 feet beneath the skin of the caldera at that time; today it is unknown what amount of liquid may be left, but the temperature just a couple hundred feet beneath your hiking boots is in excess of 1000 degrees. On this hike you should take plenty of water, light rain gear, suncream, a map and compass. In addition, you should wear sturdy hiking shoes or boots and be in fairly good physical condition. 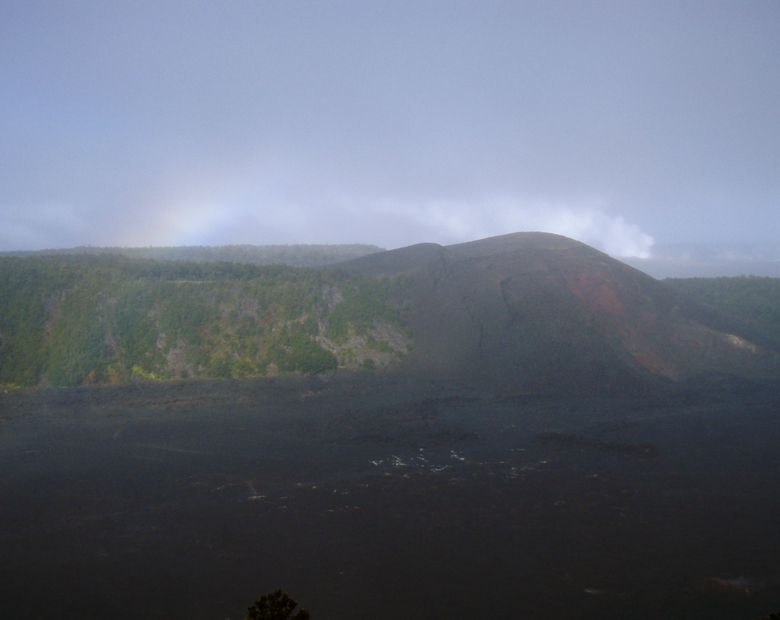 As always when hiking in the Park, it is wise to avoid the noonday sun, and to remember that afternoon showers are common, especially along the crater rims. Remember that the start and finish of this hike are at an elevation of over 4000 feet…take it easy and enjoy the incredible views. A video about this hike is available here. For more information on traveling to Hawaii in general, hiking the Big Island in particular, or about our new iPhone/iPod Touch App, please also visit www.tourguidehawaii.com and www.tourguidehawaii.blogspot.com. For information about the author, please go here. All media copyright 2009 by Donald B. MacGowan. All rights reserved.